You can sign me up for the sheet pan diet. 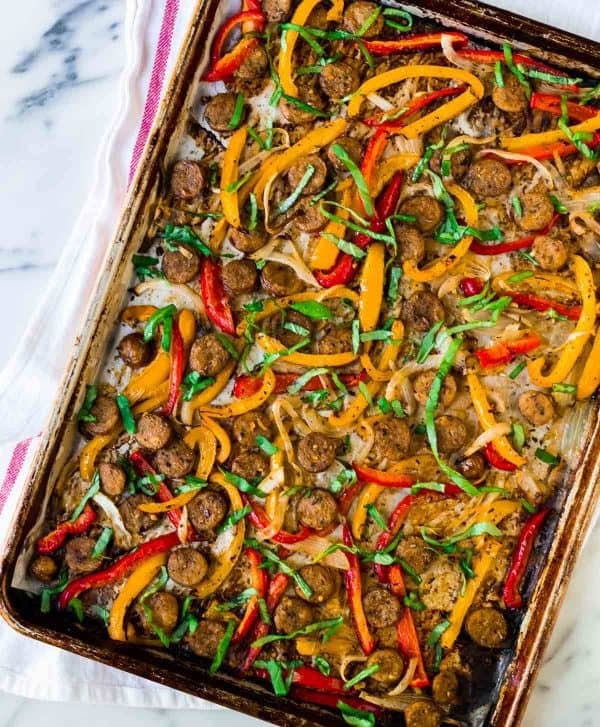 Endlessly versatile, healthy, and the simplest way to nail every food group with only one dish to wash at the end, sheet pan suppers like today’s Italian Sausage and Peppers in the oven will be your faithful weeknight dinner date. This recipe is loaded with Italian allure, ultra filling, and enjoyable either on its own or as an easy add-on to pasta, sandwiches, and more. Sausage and peppers sandwiches are our go-to weekend lunch at the lake. I love that everyone can pick their sausage of choice (I go for the hot Italian chicken; Ben for the traditional pork), then do it up right with sauce, cheese, and a stack of sautéed veg. The combination of the spice and juiciness of Italian sausage with the sweetness of bell peppers is the kind of classic, don’t-mess-with-it combo that I prize in Italian cuisine. The sublime is in the simple. We’ve been eating sausage and peppers for our summer Saturday lunches for three years running, and I’m not tired of them yet. Due to the unfortunate mash up of one of the rainiest summers to date and Ben being out of commission since his shoulder surgery, we’ve been far below our usual number of lake days. Collateral damage: we are also far below our quota of sausage and peppers lunches. 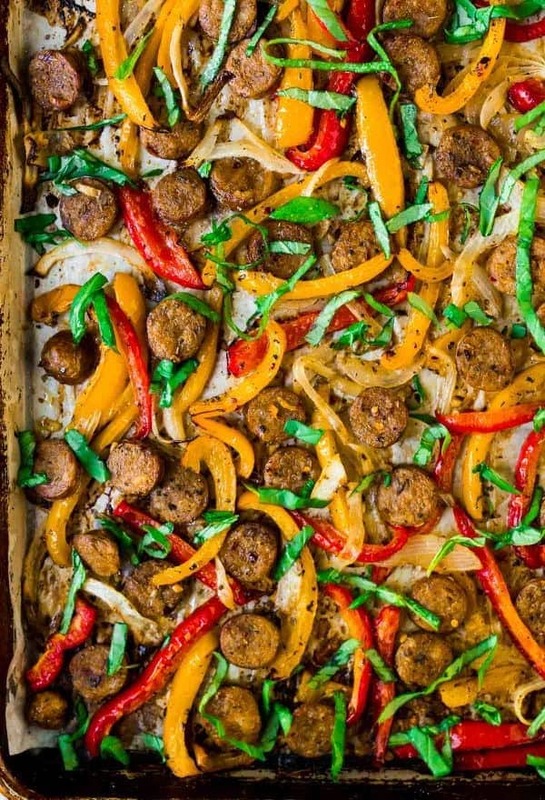 Fortunately, thanks to this simple sausage and peppers sheet pan recipe, we now have an even easier way to enjoy Italian sausage and peppers year-round! Juicy morsels of Italian sausage pan roasted with strips of sweet bell peppers, savory onions, and Italian spices, this sausage and peppers recipes is a hands-off and super tasty. Whether you are partial to sweet Italian sausage recipes or hot Italian sausage recipes, this dish has you covered. You can use any type of precooked sausage you like. I love both the hot and spicy varieties, as is evidenced by the the number of Italian sausage recipes you can find on my site…and the number of packages of “emergency” Italian chicken sausage packages that are in my freezer at this very moment. (Four. Seriously, I just got up from the computer and counted.) Pick the spice level to suit your mood, or do a mix and make every bite a surprise. A beautiful quality of sheet pan suppers like this one is that more often than not, they can serve as a full meal on their own. That said, if you’d like to stretch this recipe to a few more servings or are looking for new ways to enjoy an old favorite, you have several delish options. Turn this recipe into an Italian sausage and peppers sandwich by stuffing it inside a hoagie or similar bun, then topping it with provolone cheese. This is how we eat the Italian sausage at the lake, and it never ever disappoints. Serve the sausage and peppers with rice (for a one-pan version including the rice, check out my Sausage and Rice Casserole). For a low-carb alternative, layer it over cauliflower rice instead. 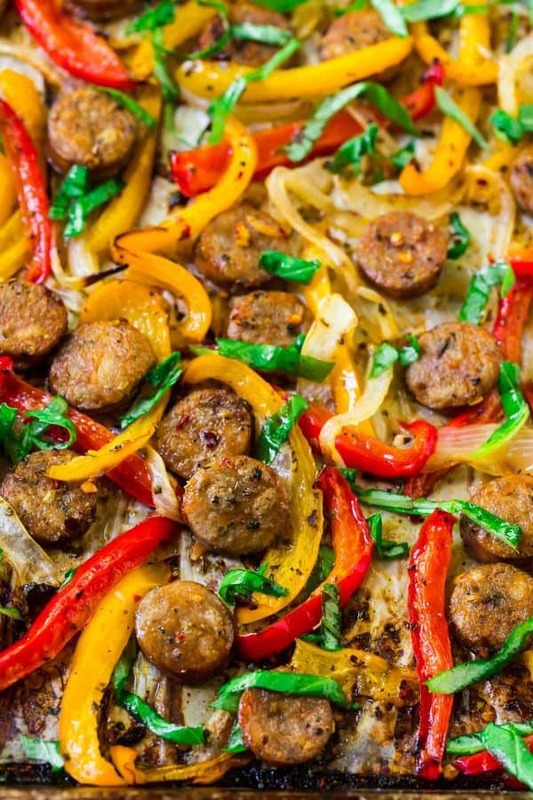 This simple Italian sausage and peppers recipe is the simplicity of a summer day, turned into a healthy, one-pan dinner you can enjoy year-round. I hope you love it as a staple in your home as much as we do in ours! Italian Sausage and Peppers in the Oven. An easy, healthy recipe! Use these sausage and peppers to top sandwiches, in pasta, or over rice, on on their own. Preheat the oven to 400 degrees F. For easy clean up, line a large, rimmed baking sheet with parchment paper. Place the cut sausage, bell peppers, and onions in the center of the pan. Drizzle with the olive oil and red wine vinegar, then sprinkle with the garlic, salt, basil, oregano, black pepper, and red pepper flakes. Toss to combine, then arrange in a single layer. Bake for 25-35 minutes, until the peppers are as tender as you like, tossing once half way through. Remove from the oven and serve hot. Store leftovers in the refrigerator for up to 4 days. Reheat gently in the microwave or in a non-stick skillet over medium low heat. I also like to sauté the leftovers with spinach, then top them with a fried egg for a tasty brunch (or brinner!). 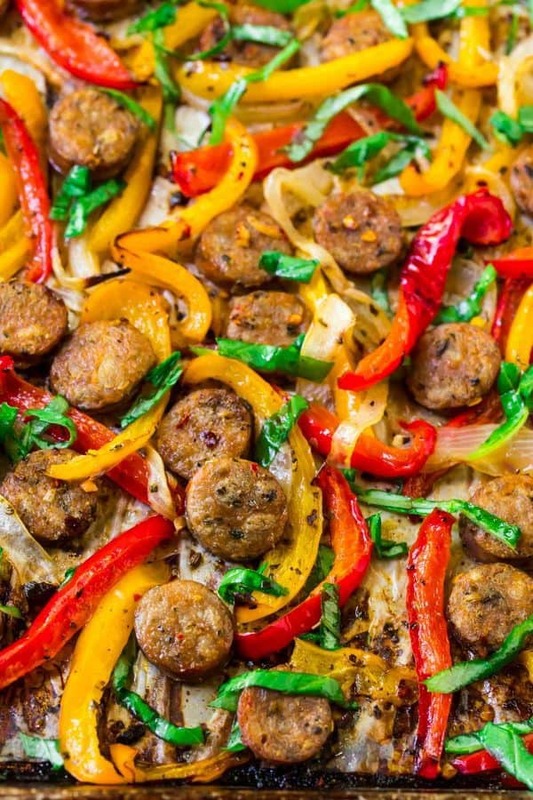 Additional serving ideas: try these Italian sausage and peppers over rice or cauliflower rice, inside a toasted hoagie bun with a slice of provolone cheese (bonus points for warming it in the oven to melt the cheese), or with whole wheat pasta noodles and tomato pasta sauce. YES! That sounds so yummy! A totally classic combination. So good. They make for an excellent sandwich combination, too. Love it! Yay for dinners that just have one pan for clean up! Great tip on serving it over a fried egg — we’re all about the brinners at my house. Can’t wait to try! I hope you love it Carissa!! Holy deliciousness, Erin! And so quick and easy too! Thanks for yet another winner. Diana, so happy to hear you enjoyed this. Thank you for leaving this great review too! It means a lot and is so helpful to others considering making the recipe too. I’m so glad you both enjoyed it, Jana! Thanks so much for taking the time to leave this review! This was absolutely delish! My husband isn’t a fan of bell peppers normally and now he couldn’t stop saying how good it was. And I love how versatile it is. Thanks for a great recipe!! I’m glad it was a success, Christine! Thank YOU for taking the time to report back! My hubby and I loved this recipe. I left out the red wine vinegar and it was so good. It was very easy to make and this one is definitely a keeper. Thanks for sharing this review, Vicki! I’m glad it was a winner! How many servings is this recipe?? Hi James! It serves about 3 to 4, depending upon how hungry everyone is and if you serve it with anything else (like bread or rice). I hope you enjoy it! So delicious! I put mine on a hoagie bun with mustard. xoxoxoxo. This means so much!